After bowing out of the U.S. Open still wearing his Stanford issue, the recently graduated Cameron Wilson teed off at last week’s Travelers Championship with a marked lack of the iconic swoosh. Instead, the immaculately cool and calm Wilson arrived in his home state of Connecticut sporting IZOD apparel, as the company announced he would last Tuesday. Wilson tweeted that he would turn pro earlier that day. That said, I’ve wanted to play pro golf for a long time and couldn’t be more excited for my debut at the @TravelersChamp next week! The agreement between Wilson and IZOD, which is owned by apparel conglomerate PVH, comes on the heels of a truly remarkable collegiate season for the Stanford grad. Wilson, who entered the 2013-14 campaign having not won a NCAA-sanctioned event, won three times over the course of the fall and spring seasons. His biggest victory came at May’s NCAA championships, where he captured Stanford’s third individual national title, the first Cardinal golfer to do so since Tiger Woods in 1996. 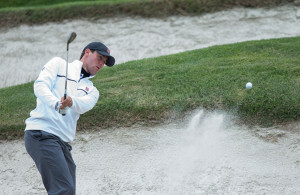 Wilson also collected PING First Team All-American honors, and rose to as high as fourth in the World Amateur Golf Rankings during his final season on the Farm. A leader for his squad on and off the course, Wilson is a veteran of two U.S. Opens and made his pro debut at the Travelers last Thursday at TPC River Highlands. Although specific terms of the sponsorship deal were not disclosed, the statement from PVH indicated it was a multi-year agreement, and that Wilson would appear in IZOD advertisements and on the company’s online and social media sites. Other IZOD-sponsored golfers on the PGA Tour include 2012 U.S. Open Champion Webb Simpson, along with Scott Piercy and Spencer Levin. Wilson also struck a deal with golf industry giant Callaway last Tuesday. He will use Callaway clubs and wear Callaway head gear for the the duration of the contract. In addition to Wilson’s deals, Nike announced last Tuesday it had signed former Stanford player Patrick Rodgers to a sponsorship contract. Like Wilson, the Travelers Championship was Rodgers’ first event as a professional.